As I type this, I’m actually at work, supervising a Magic: The Gathering draft. For those of you unfamiliar with gaming, that’s a collectible card game. I spent a good chunk of last night steam-cleaning a section of carpet in my apartment. With luck, I can spend the time between waking up and leaving for Oconomowoc for another Modern Quilt Guild meeting doing more steam-cleaning. I’m finding it more than a little disturbing that I can clearly tell which sections of carpet have not gotten cleaned. 1.) Cut the fabric for two scrappy Bouncing Betty blocks. 2.) Cut the fabric for one Rosebud block. 3.) Drew up the paper-piecing templates for one Crazy Anne block. 4.) Selected fabrics for two wonky house blocks. 5.) Selected fabrics for two Bento Box blocks. I have the paper-piecing bits printed and cut out. I have all of the PDFs downloaded to my NetBook, so no trying to read the instructions from my phone. See, I learn from my mistakes. But yay! That’s a couple steps closer to being ready for tomorrow. 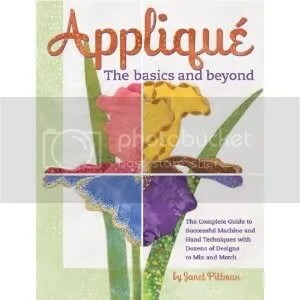 I also picked up a copy of Appliqué: The Basics and Beyond. This book caught my eye because of the pretty cover and the excellent photographs. I’ve been looking for a fairly comprehensive guide to appliqué that covers machine techniques for a while. A quick perusal of this book showed several techniques utilizing a sewing machine, so I’m cautiously hopeful. A quick glance through reveals it to be set up like a textbook, which I actually like. Areas of importance are highlight with a light yellow, so that the eye goes right to them. Photographs are well-lit, and clearly contrasting threads were used to illustrate results. I like the fact that it’s not written to condescend, or as though the reader is completely unfamiliar with sewing, or the use of their sewing machine. 1.) Wash a load of fabric. 2.) Cut the strips for the Bento Box blocks. 3.) Iron fabric that has been washed. 4.) Begin auditioning fabrics for my Modify Tradition Swap. 5.) Finish packing everything together for tomorrow, since I plan to spend the early morning hours cleaning more. 6.) Possibly begin sketching appliqué blocks for another swap. 7.) Photograph my Birthday Blockade Blocks together, on the clean swatch of carpet. It looks like a lot, listed out like that… I think the only thing I might not complete is the ironing, but that’s because I get bored with that rather quickly. Now, to go find something else to occupy myself for the duration of this shift.